What does the Risk Tolerance Slider do? 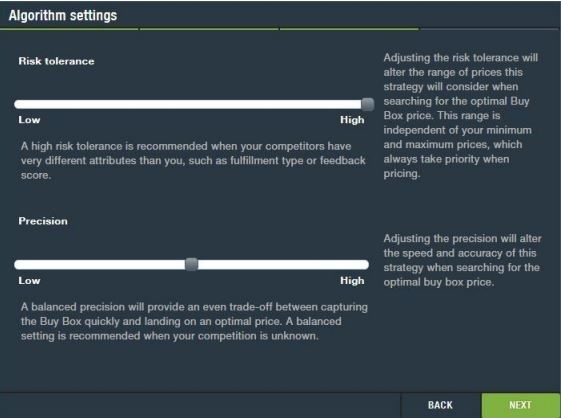 This slider determines the range of prices your strategy will consider when searching for the optimal Buy Box price. This range is independent of your minimum and maximum prices, which always take priority when pricing. What Risk Tolerance setting should I use? High-risk tolerance is recommended when your competitors have very different attributed than you such as fulfillment type or feedback score. Balanced-risk tolerance is recommended when you're not sure how you stack up in comparison with other sellers. We recommend you start off with a balanced risk tolerance and make adjustments as needed. Low-risk tolerance is recommended when your competitors' feedback and fulfillment type are similar to yours. What does the Precision Slider do? What Precision level should I use? In general, we recommend beginning with a balanced precision setting when you are starting with SellerActive and make necessary changes as you become more familiar with our system and how your pricing strategy is operating. High precision will take longer to capture the Buy Box but will be land on the optimal price which will allow you to maximize profits. This is only recommended when you have low competition for your products. Balanced precision will provide an even trade-off between capturing the Buy Box quickly and landing at an optimal price. A balance setting is recommended when your competition is unknown.